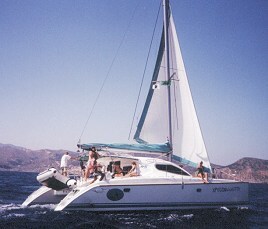 Welcome aboard Chrissovalandou, our 12 m, catamaran yacht. 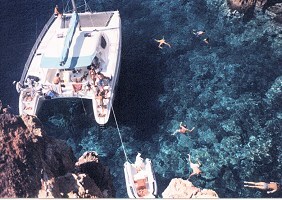 We offer skippered sailing trips around the Greek islands. Built in 1999, the Dufour Nautitech 395 is a state of the art sailing vessel. The hulls are designed with fine entry and wide beam to give her good performance, especially for up-wind sailing, the usual weak point of the catamaran. From the vacuum-bagged construction to the comfortable interior, every aspect of the 395 has been carefully thought-out and put together. Click here for specifications and performance details. 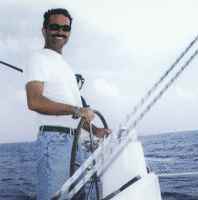 Captain and owner Nick Xenakis, a sailor with long experience in the Aegean Sea, will guide you safely to the hidden beauties of the Greek islands. Sail to your hearts content. Beginners can be initiated with the guidance of captain nick. Anchor in quiet bays with deserted beaches. Explore sea caves, natural arches using the 3.5m tender. Swim and snorkel in completely unspoilt areas. Experience the excitement of open sea fishing by trawling lines. On board the priority is comfort, style and ease of movement. What a pleasure to go from cockpit to saloon on the same level. The saloon is well-lighted and ventilated where all the guests can be seated around the sturdy table. The galley is in the saloon for the best cooking in any condition, and is equipped with large storage and large fridge capacity. There are four double cabins with en suite heads for the best possible privacy. All cabins provide standing headroom and good light and ventilation from several deck hatches in each hull, and all are tastefully finished without excessive wood veneer. The check in takes place at 17.00 o'clock approximately on the first day of your sailing cruise. The check out is arranged at about 09.00 o'clock in the morning of the last day of the charter period. During this interval, the inspection and the cleaning of the boat take place, in order for her to be in a proper and seaworthy condition for the next group. Usually, our sailing cruises start and end on Saturdays and last for 7 nights (6 days) or multiples. However, we can make any special arrangements in order to fit your schedule if it is necessary. The price that you will pay for the charter is officially stated on a contract approved by the Hellenic Ministry of Merchant Marine. No extra charges will arise at the end of your charter. The charterer has to pay only for fuel, water and gas. Apart from the optional extras that you will order, and for the price of which you will be informed when the reservation will take place, the money you will pay are clearly explained in the contract that binds both parties. Remember to bring on the boat with you only your personal possessions and your sailing equipment and uniforms. Our yacht is fully equipped to fit your demands and needs. Also, bear in mind to carry your possessions in flexible bags and not in big suitcases, as you will face the problem of where to put them! In addition, try to bring with you sports wear and athletic clothes which are fittest for sailing. Apart from those be sure that you will need nothing else; the rest are already on board.